With a vision and opportunity, Belt Tech Industrial was formed in late 1991 by Bill and Jeff Russell to serve the expanding Coal and Power Producing Companies in the area. Establishing a reputation for quality work, business grew quickly that first year leading to the need for a larger facility to handle our increasing inventory of belting, pulleys, bearings, shafting, etc. Our customer base continues to expand from our home office in Washington, Indiana. Our territory has expanded into multiple states and we now have a focus on the national market. We serve most major customers in our service area including Peabody Energy, Hoosier Energy, Indianapolis Power and Light, Vectren Energy, and Duke Energy just to name a few. Belt Tech Industrial, Inc. is your premier source for the products and services that keep your conveyor systems running smoothly. We are known for quality workmanship and products to handle the most demanding needs of our customers. From our certified splicing crews to our knowledgeable sales force you can be confident your project will be completed to your standards. 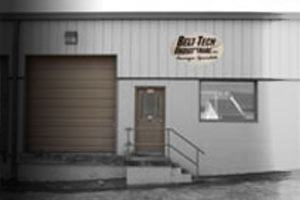 Belt Tech Industrial has always been known for innovation, from the latest splicing techniques to progressive vulcanizing and belt winding equipment.